It’s been years since I’ve been on Mille Lacs, and this was the first time fishing for smallies. I’ve fished alot over the years but NOTHING compared to the experience on Mille Lacs with you. You are a good guide, we had a GREAT day….it was a true memory. Pound for pound and boat for boat we landed the most fish and the biggest fish! 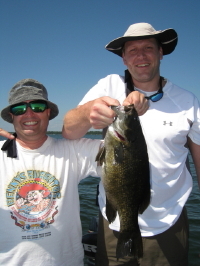 Smallie fishing with Jim will be an annual event for years to come. Jim ..Thank you for a great day and great memories.